When I woke up yesterday morning, I was exhausted physically and mentally. My thighs were somewhat fatigued from my trek up the Grind the day before, my calves were still tight as could be (just as they’ve been for the last couple of weeks) my eyes were droopy, my head was sleepy. The last thing I wanted to do was put my running shoes on. Lucky for me, yesterday was a rest day! I decided to take the day off work and extend my long weekend, but with no exercise on the agenda, what oh what was a running princess to do? Go bike shopping, that’s what! Mario found a new bike shop in Fort Langley, a cute, little historical community about a half hour from where we live, that listed Felt bikes on their website. I was a little dubious at first, given that another shop in Port Moody also said it sold the Felts, but only had like one in stock, so I wasn’t exactly holding out much hope that I’d find my bike. So many yummy chocolates to try, where oh where do I begin? I've got cherry and almond, cherry and pistachio, chai tea and spicy chili! Before heading over to the bike shop, we stopped for lunch at Tracycakes Bakery Cafe, a quant cupcakery located in a small, heritage house that kind of felt like we were back at the cottage in Manzanita as we sat outside in the backyard, with the clouded over skies, and the soft music playing in the background. But as cute as the atmosphere was – and it was super cute – I was a little disappointed with the meal. I wanted a vanilla bean tea, but they were out of that, so I settled for a bombay chai, which was actually quite nice. I ordered the ham, swiss and tomato panini with a side of vegetables, but they were out of swiss, so I had to settle for cheddar, which was okay. But the part that majorly disappointed me was the vegetables. The menu clearly stated that all sandwiches come with a side of vegetables, but when I looked at my plate, the vegetables on it was barely even a garnish – just one cucumber cut in half and two baby carrots! Are you kidding me? Thankfully Mario ordered the chili with multi-grained chips that he didn’t mind sharing. 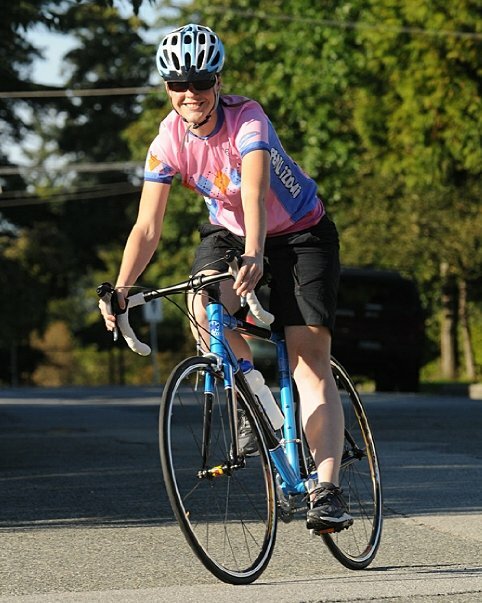 Finally, the bike shop: Fort Langley Cyclery. 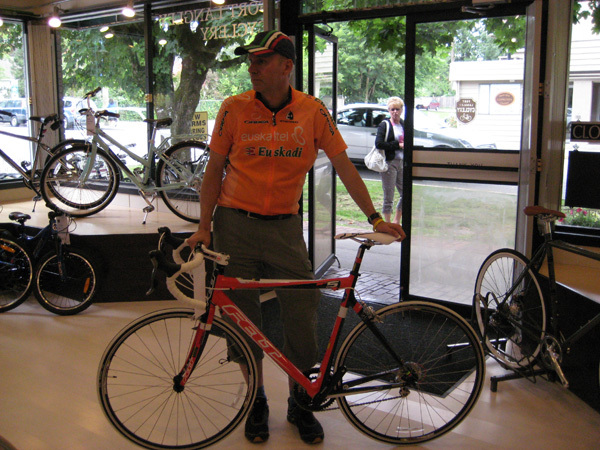 Mario had already rode by it on his way into the Fort, and was drooling over the bike they had displayed in the window: A Felt F5 in blood orange – he likes orange! Hmmm … could it be … could we soon be a Family of Felts??? 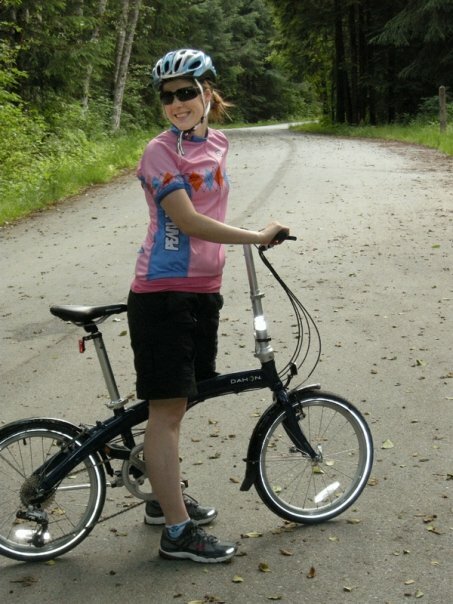 They didn’t have my bike, but they did have the model below mine, which helped me figure out the sizing. Apparently, I’m a tall, who knew? Although, the guy helping us told me not to get too excited about my new “tall” status, as Felt’s tall is more like the Starbucks tall – not so tall at all! Mario liked the shiny black and pink colour of the model I was trying out, and it was nice, but it wasn’t the colour I wanted, nor the bike I wanted. If I’m upgrading, I want a full carbon-fibre upgrade, thank you very much. They told me they could order my bike in, which, I kid you not, had the effect of butterflies swooping through my belly. Now, I’ve just got to come to terms with selling my tried and true Zing and her little fold-up buddy Storm – we don’t exactly have room for me to have three bikes in the condo. And with my manly looking Storm ... pre road cycling bike shorts! and you didn’t stop in?